But while they are perfectly placed in a share of second place, they know that the key to avenging their narrow loss to Italy in 2009 will come in the foursomes. Brendan Jones and Richard Green fired a sensational 11 under par 61 to give Australia a two stroke lead over Ireland and Scottish pair Martin Laird and Stephen Gallacher at the Mission Hills Resort (Click for scores). After helping McIlroy card seven birdies and an eagle in a nine under par effort on a blustery opening day, McDowell said: “This is a tricky golf course. It’s pretty wide open off the tee, but in that kind of a wind strength, you have to control your iron play going into the greens and we did that well today. “I think we kind of complemented each other’s game out there. When one was out, the other was in and vice versa. We are both playing solid. “Tomorrow is the most important format in this tournament. You know, tomorrow and Sunday are the big days, and Thursday and Saturday are the days where you can make up some ground. McIlroy, who saved a fine par at the last to keep a bogey off Ireland’s card, added: “We sort of set a target around eight to 10 under par that we thought was going to be a good score out there and we managed to shoot something around that, and you know, puts us in a great position going into the next three days. The Australians have seven birdies and two back nine eagles in their 61 and were understandably delighted with their start and keen to improve on their third place finish together in 2008. “We combined very well today,” said Green, who eagled the par four 16th. “Brendan obviously started very well and built the momentum. “In this game, it’s just a matter of positioning yourself and giving the other guy an opportunity if you are slightly out of position and allowing them to be a little bit more aggressive. Jones added: “It was a lot of fun. As Richard said, I made a few birdies to get the momentum started. I made a good eagle on 12, and then Richard took over. “But he’s such an easy guy to play with, because he’s in play all the time, and between us, there was always someone in the hole to give the other guy a chance. The Netherlands pair of Robert-Jan Derksen and Joost Luiten share fourth place with Americans Gary Woodland and Matt Kuchar, just three strokes off the pace after eight under 64’s. England’s Justin Rose and Ian Poulter are tied for 10th place after a 66. Graeme McDowell and Rory McIlroy are ready to bring the Omega Mission Hills World Cup back to Ireland for the third time in the country’s history. 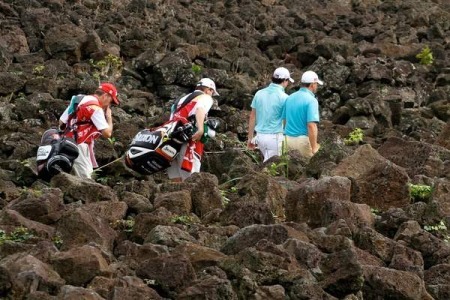 End of the world for McDowell and McIlroy? Graeme McDowell and Rory McIlroy faced each other in the Volvo World Match Play earlier this year. Now they are stablemates and team mates chasing World Cup success at Mission Hills. 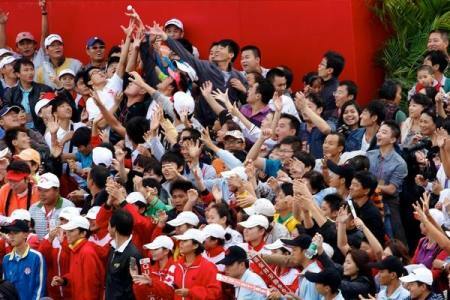 Photo Eoin Clarke/Golffile.ieRory McIlroy and Graeme McDowell are determined to take advantage of what could be their last chance of World Cup glory in China this week.